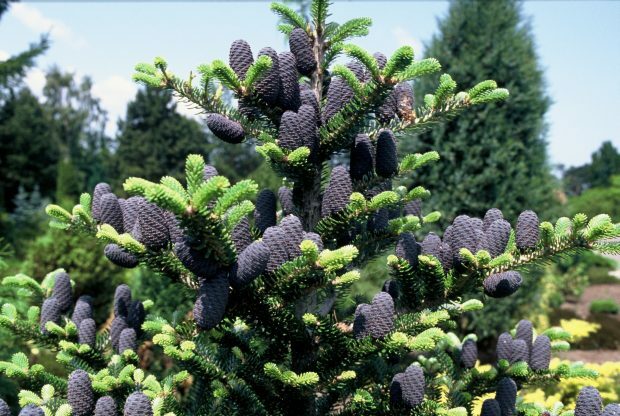 Commonly known as the Korean fir, Abies koreana is a small, slow-growing evergreen tree or bush native (as is honoured by the species name) to Korea. Mature specimens have a conical habit, combined with reasonably compact growth. It is a genuinely hardy species, although in regions which experience late frosts, the new growth can be destroyed. Under favorable growing conditions you can expect Abies koreana to reach an overall height of approximately 12 metres or more, with a width of 4-8 metres. However, growing at a rate of around 15 cm per year it may take 50 years or so to attain this. The small, rather dark-green, needle-like leaves are noted for their bright silver undersides, however this species is chiefly grown for its crimson, pink or green female flowers which are borne freely in May. The flowers stand in upright lines along the shoots. The male flowers are globular, red-brown opening to yellow and are clustered among the leaves. Handsome blue-green cones follow which are approximately 10 cm long, but only one the plant had matured, usually once it has reached 1-1.5 metres tall. 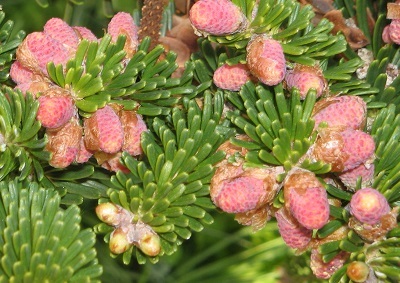 Plant Abies koreana in a sunny, sheltered position in a moist, but well-drained, slightly acidic soil. Avoid alkaline or chalky soils. Abies koreana will be best planted in November on light soils or in April on heavy soils. Maintain a weed free margin around the roots for the first few years until the root system has properly established. After this period mulch each spring, but avoid the mulch touching the trunk, Then apply an annual dressing of balanced fertiliser in early May.